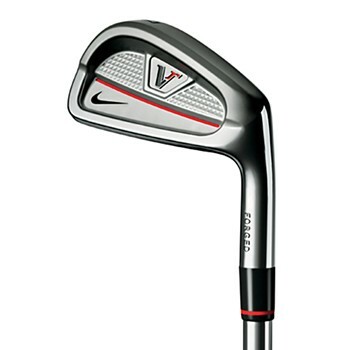 The Nike Victory Red Forged Split Cavity irons are constructed from 1025 carbon steel and are precision forged and machined to precise tolerances for unsurpassed feel and consistency. 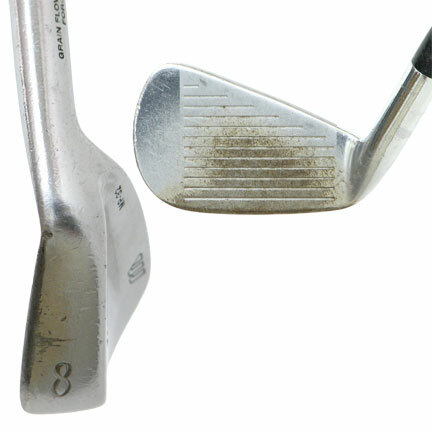 They feature a split cavity-back design that keeps weight behind the sweet spot for control and forgiveness. Its cambered sole allows for more playability from a wider variety of lies, ensuring precise contact. These clubs are sweet. They took a little getting use to after switching from much more forgiving clubs in full cavities. I can honestly say I get 10 yards more on my shots with these over the full cavities. I would recommend these to anyone who thinks they can handle them. If your swing is inconsistent I would not recommend these clubs as the mishits come out and show themselves much more than from a full cavity iron. But if you have a consistent swing or close to these clubs will improve your game greatly, making your swing more consistent with the smaller sweet spot. The workability of these clubs are amazing, the stock grips and shafts are nice, but the shafts are considerably heavier than some steel shafts on other clubs. I highly recommend these clubs if your looking for a new set. these irons might not be the best club for an amateur to use but if you are a better golfer the clubs will give you awesome workability and feel like a blade would, but the have the split cavity which gives more forgiveness than the blades. What a JOY to play these sticks!Cant be happier or more inspired to play better when these are in the bag,I wen't from a set of graphite confidence clubs that felt very noodley to these,and boy there is no comparisone but the feel and control I now have is sweet.1 season of golf on these and can finaly write on these clubs.when your game is on these baby's will set the ball write where you wan't it,off center hits will still be forgiving but then agian it gives good feedback on where you need to adjust.when you hit it on the sweet spot you get good ball flight and distance, Oh and RAD spin.nice foged face with nice deep grooves give's excellant ball control,I wen't with the split design instead of the full cavity becuz the full seamed a little chunky at address and as well when I hit them.some don't like the grips but haven't had a club slip out of my hands yet even when swetty from nerve's or spilling a cold one on the hands, a little firm for most but all in all grips will let you rip,overall balance is why I like these clubs when you pick them up they feel just right, many of my golf buddys are hitting hybrids off the tee while I'm hitting an Iron and can get just about the same distance and better precision at time's when playing.Over all do your home work and go to a place where you can touch and feel differant clubs it makes a big differance in choice facters.I appreciate the technology thats in these clubs and they dont dissapoint when it comes to game time,they just inspire you to learn to play better! i just started hitting golf balls about 4 months ago, being from the mecca of golf"augusta georgia" i was going to pick up a club one day. my bro in law gave me a old ragged set of clubs just to hit, after a month i had golf fever, so i decided to get a used set of clubs, well i found the nike vr splits 3-pw and i can honestly say these clubs feel great. i read alot of reviews saying the set isnt for beginners well i hit the vr str8 and way father than the worn out clubs my bro gave me. truth be told buyin these clubs would be a great decision becuz u will grow into them. im not a rich guy so i need clubs that will last as i got better in the game. I am an 18 handicap (as of last season). I had a set of old Nike Slingshot knock-off's from 10 years ago. My son's coach (class A PGA professional) thought better clubs would definintely improve my game. I couldn't resist the deal I found on Global Golf for the Split Cavity Nike VR's. At the range I already feel a huge difference and prob get 10+ more yards per club, easily. Great feel, though the grips are a bit hard on the epidermis! Global Golf delivered, quickly and seamlessly. It is now up to me to get my handicap down! Thanks GG! !